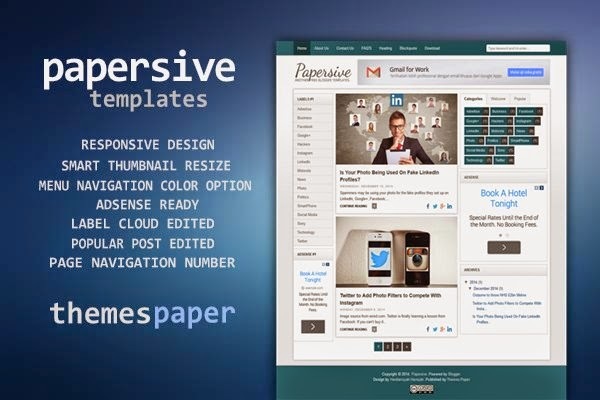 Papersive is free blogger template with 3 column layout, gardient color background, label cloud and popular post edited. Papersive is a simple, clean, personal, modern and professional blog ideal for making a professional blogging and elegant websites. This template is totally responsive so it adapts to your style as well as the device it’s viewed on. It is clean and fresh style and high user friendly blogger template. Go to layout tab and click header widget section. Upload your image logo from your computer. Your logo size should be 230px x 90px with black background color. Do not forget to expand "Instead of title and description". Click save and see the result. Now you can download Papersive Blogger Template for free only in Themes Paper, but please do not remove the credit link in the footer section. If you have question about this template, leave your comment below or you can contact us on themespaper [at] gmail.com. Thanks. Thanks for enhancing my knlwledge. Merely takes a simple awesome and additionally revealing content. Prefer beloved the software. Regards just for offer right around. Keep on writing a great deal more. Papersive is actually a very simple, cleanse, very own, present day plus qualified site just the thing for getting a qualified blog plus exquisite web pages. The following web theme is completely receptive it adapts to the design and style together with the machine it’s deemed for. Excellent piece of information, you've posted about game levels for us, such a good guidelines that you wrote, Thank you!